A collection of 26! scripts to make your life easier in After Effects. Use the included toolbar or use individual scripts in your own workflow. Script icons are also provided if you choose to use them with other toolbars such as ft-Toolbar. What's new and changed? - Click the version history tab above or simply watch the videos. Version 2.1 - 3 additional scripts included. 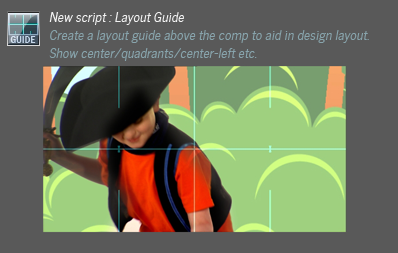 Simply adds a mask based guide layer to the comp. Indicates center of comp, quadrants, center left/right. Useful for design layout. This compliments the grid system and title/action safe. 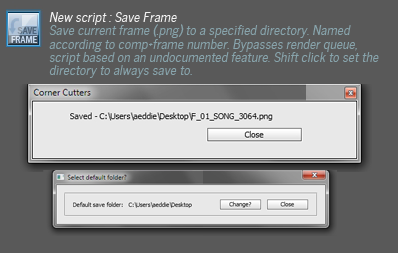 One click save the current frame to disk (.png file). File is named using the comp and the frame number. Shift click to save the default output folder. This is based on an undocumented feature so may not work on all versions of After Effects. If a folder has not been set up it will save the image to the desktop. Why have anonymous Adjustment layers? Change the names of the layers to reflect what effects are on them. Quick and useful to see what layers are providing what effects in your comp. 26 Tools included in the bundle - Scroll down to bottom- links to videos of each script. All the scripts below link to a specific time in the tutorial video. Sort the project panel into folders. Looks at the items in the project panel and tidies them up into new folders, ie. Compositions, Audio, Stills, Footage, Solids, Missing Footage, Old Folders and Vectors. (New - now you can choose your own folder names.) Any old folders are dropped into ‘Old Folders’. A God-send for messy animators! It’s also a useful way of isolating missing footage or perhaps footage from stills and to reveal your missing items too. Also can be used to see how many items are in your folders by revealing the comment tab in the project panel.You can tidy only certain types if you wish, like if you want to put all vectors and missing footage into their own folders. Also included an “Ignore selected” option to exclude files and folders in the root folder. Use layer tagging & colour to see what's done and not done. The 'Traffic lights ' analogy uses red for 'NOT DONE', orange for 'IN PROGRESS', and green for 'DONE'. Re-running the script cycles through the states. Useful if you need to keep track of what's done or what isn't. Unfortunately the layer colour will only change with AE CS5+ users. After one cycle of clicks, it deletes all markers if you want to get rid of the tagging. Be aware that this script deletes all previous markers on a layer. New- Shift&Click to save your own personalized tag names. Toggle the background between common colours white, mid-grey and black.Useful when you want to render something out as straight against white rather than premultiplied against black. Also useful to see how your alpha is compositing against light and dark colours before rendering. Uses the white content of a layer as a matte for itself. Click again to invert. Each subsequent click toggles the invert. Check the video tutorial for some uses. Reloads selected layer(s) from the timeline so you don’t have to go to the project window, reveal the footage and then reload it, a small timesaver. Also this script attempts to heal links to missing footage. If you delete a file on your file system, After Effects marks it as missing and the reload footage function will not work. You would have to navigate to find the new file. This script will check the path and re- import the item if it has been returned to the file system. This can be helpful if an imported sequence is being updated repeatedly on your file system. Replace the source footage for the selected layer. Another small timesaver, you don’t have to reveal the source item in the project window and then replace that item. Just select the layer and click the button to swap something out. 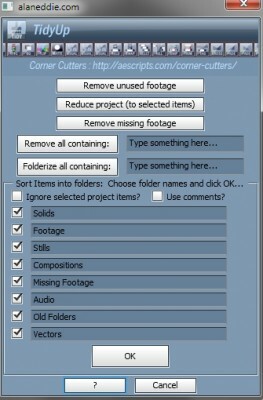 Be aware this swaps out the footage in the project panel so will affect any other comps using that footage. If nothing selected - adds an adjustment layer with your Usual FX applied. 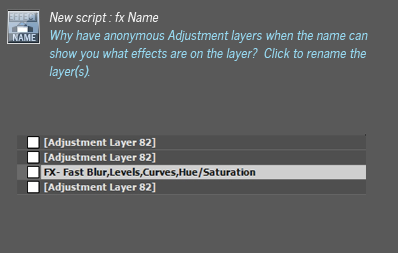 If layer(s) are selected then it just applies these effects to the individual layers. You set your effects preset by selecting your effects, Alt&Clicking the button, and saving the preset as instructed. To help you remember what the effect/preset is, you can change the helptip in settings. There are now 3 buttons instead of one. You must save them in the Corner Cutters Folder as 1.ffx, 2.ffx, 3.ffx for this to work. Selects all layers under the currently selected layer, to aid with basic editing and layer sliding.Sometimes it is useful when you need to slide a large group of layers. Alt&Clicking - selects here up instead. Searches comp and removes any space between layers by ripple editing backwards. Useful when there are accidental gaps between edits. There is an option to ‘Preserve overlaps’. This will not slide the layers back if layer B’s start comes before layer A’s outpoint. (if you have some transition operations in place). Check out the video tutorial for more clarity on this one. Alt&Click works in the opposite layer stacking order, if you work that way. This is a useful tool for editing clips quickly to an in and out point and rendering the result. On click 1, it snips to an in point, on click 2 it snips to an out point and sets the work area to the resulting in and out of the layer. On click 3 the entire composition is trimmed to the in and out of the layer and the script asks the user if they want to render the comp. Useful if selecting individual clips from a longer piece of footage. Set your time in frames using Shift+Click. Trims one selected layer to the time chosen(using work area). Then pushes the work area forward by the chosen time and leaves cursor in the centre. This allows you to slide a layer to find a good key point in the footage, then go again. Great for selecting clips quickly that need to be a specific duration and assembling a quick edit. Click - copies the layer name to a marker on the layer. Useful so you are not scanning to the left to see what layer you are working on, provides more clarity.Shift&Click - removes all markers on the layer.Alt&Click - tags the layer with the names of the effects applied to the layer. Useful to keep an eye on what an adjustment layer is doing. Creates a cross-dissolve transition between 2 layers, blending layer A out to the current time. Uses the Blend effect which is nicer than using opacity. Set the time desired (in frames) in the green edit text box. A one click solution for a repetitive task. Very useful for light editing in After Effects. Alt&Click uses alternate layer order.Shift&Click - Choose blend time. -New- Alt&Click gives a Fade to/from option. Shift&Click - Choose fade time.Fades layer(s) in and performs correct inpoint trimming. Set the time desired (in frames) in the green edit text box. This works with Lights (Intensity) & Audio (Levels) too. -New- Alt&Click gives a Fade to/from option. Shift&Click - Choose fade time.Fades layer(s) out and performs correct outPoint trimming. Set the time desired (in frames)in the green edit text box. This works with Lights (Intensity) & Audio (Levels) too. Feathers mask(s) on a layer by increments (+ or -). Increment adjustable in the yellow edit text box. Eliminates the need to individually select masks and the feather property. With no mask selected - increments all the feather values by the chosen amount, otherwise acts on only the selected masks. New- Alt&Click causes negative pixel increments. Shift &Click sets the increment pixels also. Expands mask(s) on a layer by increments (+ or -). Increment adjustable in the yellow edit text box. Eliminates the need to individually select masks. With no mask selected - increments all the expansion values by the chosen amount, otherwise acts on only the selected masks. New- Alt&Click causes negative pixel increments. Shift &Click sets the increment pixels also. Simply enter a frame value for the length of the current composition. I find I have to constantly edit the length of a composition many times a day so it’s good to have this functionality exposed. Enter a value and hit return.Click the button underneath to switch frames/seconds. Adds a solid to the current comp(with a hue/sat effect to adjust the colour). Adds an adjustment layer to the comp. Adds a null to the comp. Adds a camera to the comp. What's new and changed? - Click the version history tab above. Upgrade notice: If you are a v1 owner you will need a new license for Corner Cutters 2. The upgrade is FREE but to receive your license you need to add this new version to the cart and checkout. Make sure you login (or create a new account) with the same email address that was used for the original purchase. Please contact support if you have any questions about this. User license displayed in the settings. Settings button for options and help. Smaller buttons, save screen space. Edit boxes are colour coded to script buttons. 2.0-Ignore selected option included. Only tidy certain elements. AED_TrafficLights-Choose your own tag names. AED_FlipColourize - Slider operated now for simplicity. AED_SelectHereDown- Alt&Click selects here up. KillDeadSpace - Alt&Click operates alternately working bottom to top. AED_AutoTrimmer - Sequentially trimming clips in the timeline using work area. Choose own trim length. AED_LayerTag- Copy Layer name to marker. Shift&Click = remove all markers. Alt&Click = copy effectnames to markers. Fade in/out/CrossBlend - Alt&Click gives a “to or from here” option. 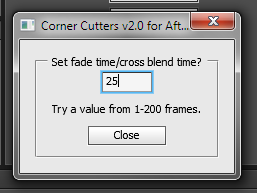 -Shift&Click = Set the fade time inframes(or use edit boxes). Mask expansion/contraction script now included.New-Mask scripts- Shift&Click- sets pixel amount. (or useedit boxes).-Alt&Click- on the 2 mask scripts changes pixel value to negative on the fly. Add element buttons - Solid, Adjustment layer, Null and Camera. CompDuration-click button to enter seconds or frames. 2.0-Fix-crashing on Flip Colourize and feathering scripts when keyframes present. 2.0-Fix-UI coding cleaned up to prevent workspace errors. 2.0-Fix-Bug in AED_SwapFootage fixed.Fix-Website links fixed and now launch properly. 2.0-Fix - Buttons missing on the help panel (CS3 and 4). 2.0-Other -CS3 no longer supported.